Transform your bedroom style with this unique panel bed. Highlighted by silver-colored highlights, the bed showcases a large panel-designed headboard and footboard. Fusing transitional and contemporary style elements, this piece is a wonderful centerpiece for your bedroom space. 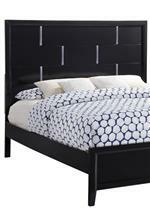 The 1014 King Panel Bed by United Furniture Industries at AHFA in the area. Product availability may vary. Contact us for the most current availability on this product. 1014-66 King Headboard and Footboard 1 0" 0" 0"